On Saturday, I trekked down to Fremont for the Solstice Parade. It's an annual event in Seattle but I've never been able to go before due to work. This year I had the day off so I went. I missed half the parade because the bus was late and...well...let's just say if I get to go next year I'll go a heck of a lot earlier. I finally found a fair vantage point and took what pictures I could. It was difficult because there were so many people there. I found it to be fun. The parade is a no-holds-barred event. There are naked bicyclists (I missed them), political statements galore, and just plain, bohemian, wacky fun. It's got the Greenwood Seafair Parade beat by a mile. I think I'd like to go again, get there early, get a good place for picture taking, hang out and have a good time. If schedules allow I will attempt to go next year. Meanwhile, enjoy the few pictures I took and read this article if you're curious for more info. By the way, on the way home, I was all set to catch the bus but one never came so I walked home...about 60 blocks...maybe 2.5 miles. Good exercise. I'm a creative guy living in the Pacific NW with my creative gal by my side. 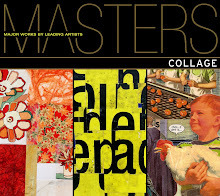 A selection of my art will be featured in the book Masters: Collage published by Lark Books in June 2010.